The Westminster Eagle contacted Kim for some reason since they heard that she’s an Americorps alum. Guess it was to do with the Inaugural parade. 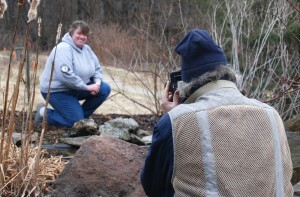 They wanted a photo to go with it, so they arranged a photog to meet her at Bear Branch for a Mug Shot Head shot. I tried to stay out of the way. This was shot thru the window from inside.